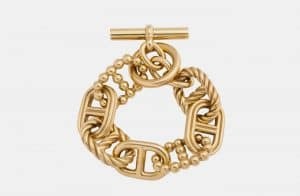 Rare Hermes jewelry is a virtual Gold Mine. And Hermes lariats that are handwoven. The Hermes Chaine d’Ancre bracelet. 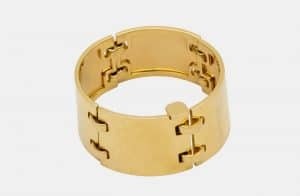 One of few made in gold, a flexible, hinged cuff, 1.5 inches wide. Fits most wrists. Signed Hermes, Paris. 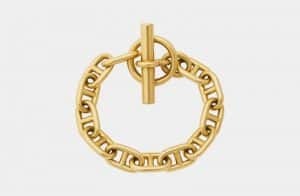 Hermes 18k gold “tresse” chaine d’ancre bracelet (the largest size). Designed by Georges L’Enfant for Hermes in the 1970’s, these are no longer made and are quite collectible. All are signed and numbered, Hermes, made in France and have the L’Enfant stamp. 22.5 cm. long, 91.23 grams. One of three ever made, over 195 grams. 9 inches long and 7/8 inches wide. 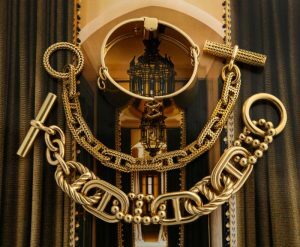 This is a stunning, special version of the iconic Hermes Chaine d’Ancre. Signed Hermes Paris. 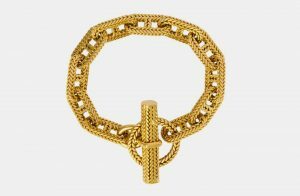 This is a longer version of the classic chaine d’ancre bracelet at 8.75 inches long, which allows for easy on-and-off. The links measure .4 inches wide. Approx. 150 grams. 18k, signed Hermes France. 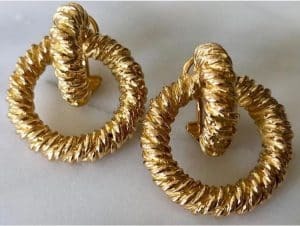 Hermes 18k gold earrings composed of two textured and intertwined rings. Approx 30.7 grams. 1.2 inches in height. Signed and numbered.